From over two million kilometers away, a powerful camera on NASA’s Origins, Spectral Interpretation, Resource Identification, Security-Regolith Explorer (OSIRIS-REx) spacecraft will “see” the tiny asteroid Bennu for the first time, helping to guide the spacecraft to its destination. Once there, its versatile focus mechanism will transform the camera from a telescope to a microscope, enabling it to examine tiny rocks while only hundreds of meters from the asteroid’s surface. This camera, called PolyCam, is part of an innovative suite of three cameras designed and built by the University of Arizona’s Lunar and Planetary Laboratory (LPL). Together, these cameras will enable the OSIRIS-REx Asteroid Sample Return mission to map the asteroid Bennu, choose a sample site, and ensure that the sample is correctly stowed on the spacecraft. 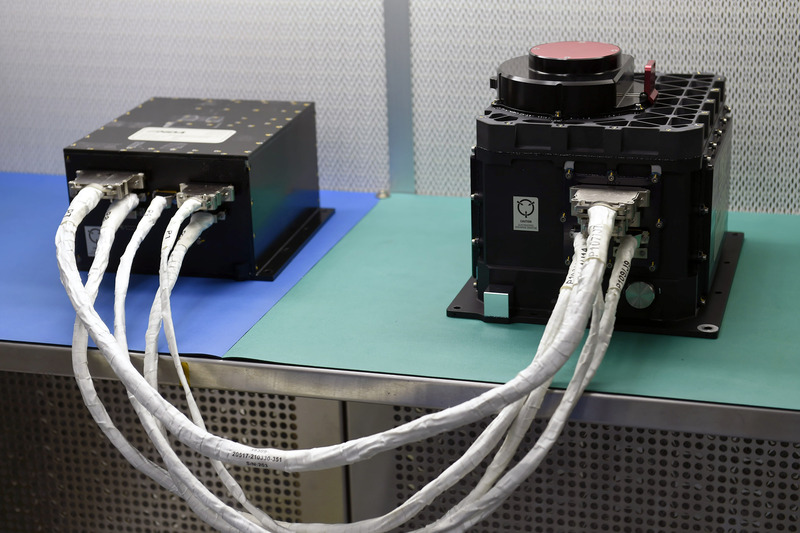 The University of Arizona delivered the OSIRIS-REx CAMera Suite (OCAMS) instrument to Lockheed Martin Space Systems in Littleton, Colorado, today for integration onto the OSIRIS-REx spacecraft. The largest of the three cameras, PolyCam, is small telescope that will acquire the first images of Bennu from two million kilometers distance and provide high resolution imaging of the sample site. MapCam will search for satellites and outgassing plumes around Bennu, map the asteroid in color, and provide images to construct topographic maps. SamCam will document the sample acquisition event and the collected sample. The OSIRIS-REx mission is scheduled to launch in September 2016 to study Bennu, a near-Earth and potentially hazardous asteroid. After rendezvousing with Bennu in 2018, the spacecraft will survey the asteroid, obtain a sample, and return it to Earth. OSIRIS-REx is the first U.S. mission to sample an asteroid, and will return the largest sample from space since the Apollo lunar missions. Scientists expect that Bennu may hold clues to the origin of the solar system and the source of water and organic molecules that may have seeded life on Earth. Bennu also has a relatively high probability of impacting the Earth late in the 22nd century. OSIRIS-REx’s investigation will inform future efforts to develop a mission to mitigate an impact, should one be required. While SamCam and MapCam were made exclusively by LPL, PolyCam’s optics and structure were made through a joint program between LPL and the University of Arizona’s College of Optical Sciences. PolyCam’s unique focus mechanism is also the basis of LPL’s first patent application. 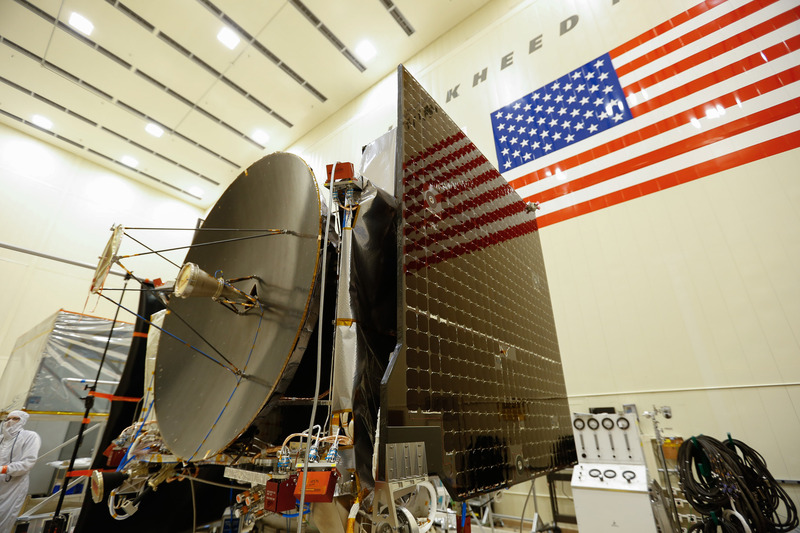 NASA’s Goddard Space Flight Center in Greenbelt, Maryland provides overall mission management, systems engineering and safety and mission assurance for OSIRIS-REx. Dante Lauretta is the mission’s principal investigator at the University of Arizona, Tucson. Lockheed Martin Space Systems in Denver is building the spacecraft. 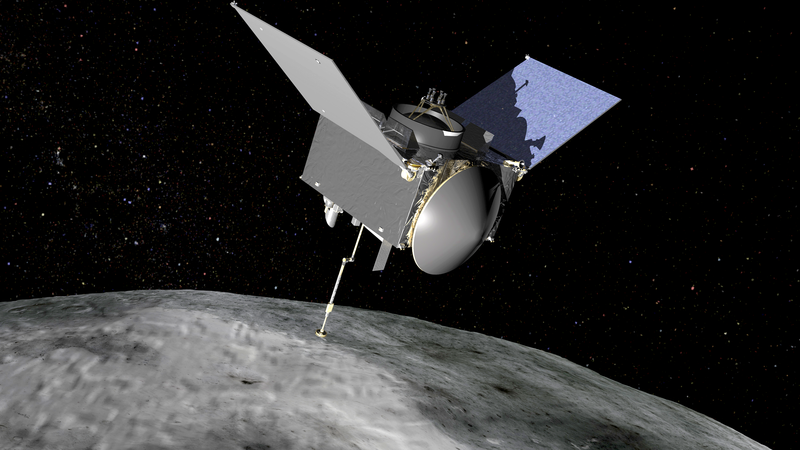 OSIRIS-REx is the third mission in NASA’s New Frontiers Program. NASA’s Marshall Space Flight Center in Huntsville, Alabama manages New Frontiers for the agency’s Science Mission Directorate in Washington. An instrument that will explore the surface of a primitive asteroid in search of water and organic materials has arrived at Lockheed Martin Space Systems in Denver for installation onto NASA’s Origins, Spectral Interpretation, Resource Identification, and Security–Regolith Explorer (OSIRIS-REx). 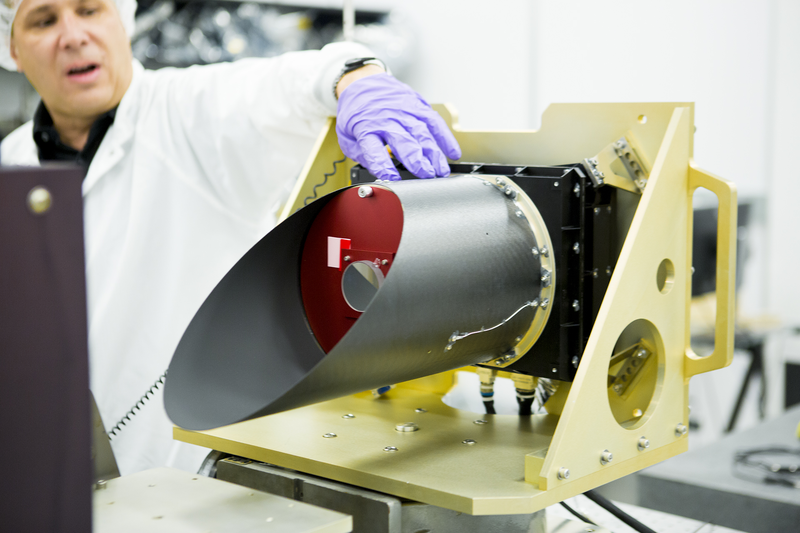 The OSIRIS-REx Visible and Infrared Spectrometer (OVIRS) measures visible and near infrared light from Bennu, which can be used to identify water and organic materials. Goddard built the instrument. OVIRS, a point spectrometer, will split the light from the asteroid Bennu into its component wavelengths, similar to a prism that splits sunlight into a rainbow, but over a much broader range of wavelengths. Different chemicals have unique spectral signatures by absorbing sunlight and can be identified in the reflected spectrum. The spectra provided by the instrument will help guide sample site selection. “Through the team’s efforts, OVIRS has become a remarkably capable instrument which we expect to return exciting science from the asteroid, Bennu,” said Dennis Reuter, OVIRS instrument lead from Goddard. After thorough testing with the spacecraft on the ground, the instrument will be powered on for check-out shortly after launch, with first science data collected during the Earth gravity assist in September 2017. OSIRIS-REx is the first U.S. mission to return samples from an asteroid to Earth for study. The mission is scheduled for launch in September 2016. It will reach its asteroid target in 2018 and return a sample to Earth in 2023. The spacecraft will travel to a near-Earth asteroid, called Bennu and bring at least a 2.1-ounce sample back to Earth for study. The mission will help scientists investigate the composition of the very early solar system and the source of organic materials and water that made their way to Earth, and improve understanding of asteroids that could impact our planet. NASA’s Goddard Space Flight Center in Greenbelt, Maryland, provides overall mission management, systems engineering and safety and mission assurance for OSIRIS-REx. Dante Lauretta is the mission’s principal investigator at the University of Arizona, Tucson. Lockheed Martin Space Systems in Denver is building the spacecraft. OSIRIS-REx is the third mission in NASA’s New Frontiers Program. NASA’s Marshall Space Flight Center in Huntsville, Alabama manages New Frontiers for the agency’s Science Mission Directorate in Washington. This week marked the completion of an important step on the path to spacecraft assembly, test, and launch operations for the Origins, Spectral Interpretation, Resource Identification and Security – Regolith Explorer or OSIRIS-REx mission. The OSIRIS-REx spacecraft core structure is successfully lowered and mated to the hydrazine propellant tank and boat tail assembly at Lockheed Martin, Denver, Colo. The team met at the Lockheed Martin facility in Littleton, Colorado during the week of February 23, 2015 to review the plan for integrating all of the systems on the spacecraft, such as the scientific instrumentation, electrical and communication systems, and navigation systems. Successful completion of this System Integration Review means that the project can proceed with assembling and testing the spacecraft in preparations for launch in September 2016. Assembly and testing operations for the spacecraft are on track to begin next month at the Lockheed Martin facilities in Littleton. 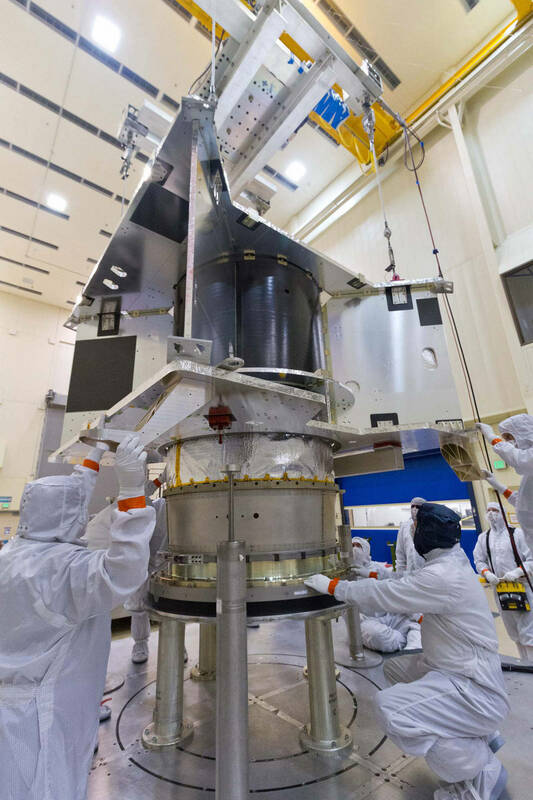 NASA’s Goddard Space Flight Center in Greenbelt, Maryland, will provide overall mission management, systems engineering and safety and mission assurance for OSIRIS-REx. Dante Lauretta is the mission’s principal investigator at the University of Arizona. Lockheed Martin Space Systems in Denver will build the spacecraft. OSIRIS-REx is the third mission in NASA’s New Frontiers Program. NASA’s Marshall Space Flight Center in Huntsville, Alabama, manages New Frontiers for the agency’s Science Mission Directorate in Washington.